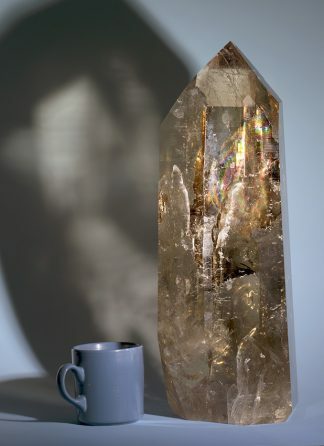 Seven huge rainbows in one Brazilian clear smoky citrine quartz castle looks tan in the sunlight, and clear gold in your house. Light it up to glow in full spectrum glory. Is this the best rainbow crystal EVER? The largest rainbow is over 6 inches long- a giant rainbow amongst crystals! Selectively polished quartz, with some smooth sides and some naturally faceted sides. Polished bottom facet to stand straight up. Enjoy the world’s best rainbows during the night or daytime.